Treehouse Brand Stores make official clothing for many of Electronic Arts' biggest franchises. Like Mass Effect, for which it will soon be releasing this. 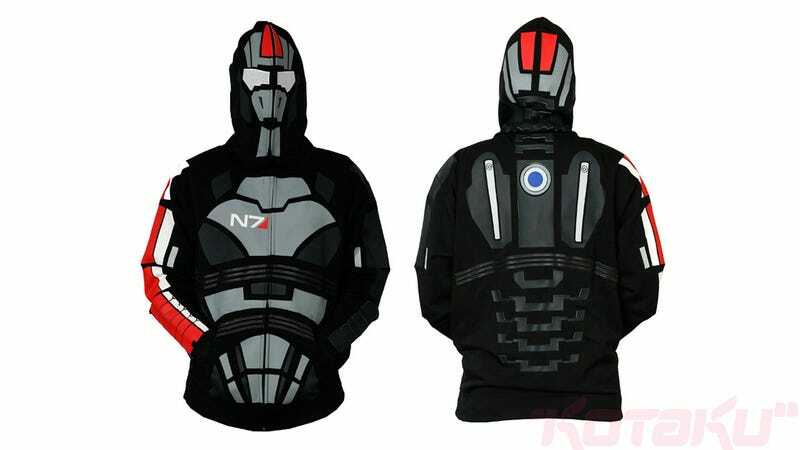 It's a hoodie that does as good a job a hoodie can do of looking like Mass Effect's trademark N7 armour, complete with shiny bits and, best of all, a hood that doubles as a helmet (complete with holes so you can see out of it). It should be going on sale very soon on BioWare's online store. Also, while we're talking EA and hoodies, you remember that Dead Space 2 design we showed you the other day? From the super-talented Indonesian artist machine56? EA and Treehouse saw it and told us they are "working together to get his design produced and for sale". Which is awesome.